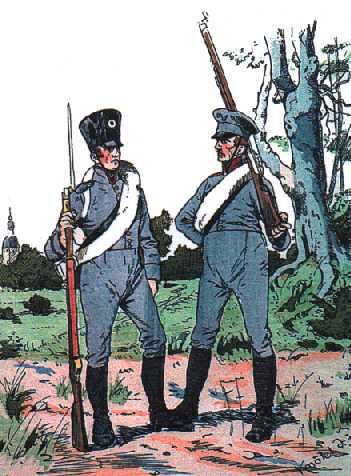 Illustration showing the typical Prussian Landwehr uniform. Note the cap band which was also in the provincial colour. Although this illustration shows the troops wearing the provincial colour on the cuffs, this was not always the case. Illustration courtesy Haet Industrie. Reserve - After the defeat of 1806 and the subsequent restrictions on the size of the Prussian army, efforts were made to increase the pool of trained manpower for the army by discharging trained soldiers from the ranks and replacing them with raw recruits. This system of creating a trained cadre of reservists or "Kruemper" enabled Prussia to quickly raise the strength of its army after Napoleon's disastrous Russian Campaign of 1812. The first Prussian reserve battalions were formed in early 1813. By Summer 1813, 12 Reserve regiments were formed. During the army's reorganisation of March 1815, these 12 Reserve regiments were incorporated into the line as Regiments 13-24. The various Freikorps which fought during the Wars of Liberation of 1813-14 were incorporated into the line as Regiments 25-27. The 28th and 29th Regiments were formed from the infantry of the former French ally of Berg. The Russo-German legion was also taken into the line as Regiments 30 & 31. Landwehr - The Prussian Landwehr (militia) was hurriedly raised in 1813 in an effort to bring all available manpower to bear against the French occupation. By Summer 1813, 120,000 men had been recruited into the Landwehr - consisting of almost half the strength of the Prussian army. Prussian commanders were initially skeptical about the value of the Landwehr, but what the troops lacked for in equipment, they made up for in spirit. By the end of 1813, battle hardened and equipped with captured French weapons, the Landwehr was considered the equal of the line regiments. During the 100 days' campaign, each Prussian infantry brigade consisted of 2 line and 1 Landwehr regiment. Reserve - The Reserve regiments were organised along the same lines as the regular line infantry. Each regiment consisted of 3 battalions. Each battalion of 4 companies. Each battalion had a full strength of around 800 officers and men. Landwehr - A Landwehr brigade consisted of 4 battalions. Each battalion contained 4 companies. Total battalion strength was around 600-800 officers and men. Reserve - Prussia was not a rich country to begin with and its defeat in 1806 resulted in massive indemnity payments to the French. This combined with the rapid pace of mobilisation in 1813 meant that there were insufficient uniforms for the Reserve regiments. Most wore either the provisional grey uniform (fig.1) or a variety of British-supplied uniforms (fig. 2). There was little standardisation even within the same battalion and a mix of all available uniforms (supplied and captured) were used. 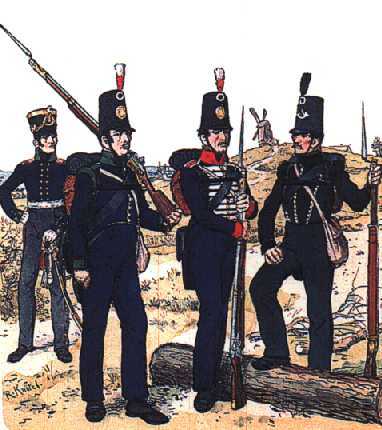 During the reorganisation of March 1815, when the Reserve regiments were incorporated into the line, an attempt was made to supply them with proper Prussian uniforms. However, the swift return of Napoleon and the opening of the 100 days' campaign meant that not all units could not be equipped with standard Prussian equipment. As a result, although some of the officers and NCOs had already been equipped with the standard Prussian line infantry uniform, many units went into battle wearing the provisional grey or British-supplied uniforms, or other mixtures of foreign supplied or captured items. 25th Regiment (formerly Luetzow's Freikorps) which wore a black Litewka (long jacket) with yellow buttons and red piping on collar, cuffs and shoulder straps. 30th and 31st Regiment (formerly the Russo-German Legion) which wore Russian uniforms. Fig 1 - Showing an example of the provisional grey Prussian reserve uniform. This illustration shows 2 members of the 7th Reserve Regiment (1813) or 19th Inf Regiment (1815). The figure on the left wears a straw shako with waterproof cover. The right figure wears the grey "Schirmmuetze". Illustration from Knoetel. Fig 2 - This illustration shows the various types of British-supplied uniforms worn by each of the 3 battalions of the 9th Reserve Regiment in 1813. From L-R: Officer, Musketeer of the 1st battalion (dark blue jacket and pants), Musketeer of the 2nd battalion (dark blue jacket and pants) and Fusilier of the 3rd (Fusilier) battalion (British rifle green uniform). Illustrations by Knoetel. Figs 1 & 2 courtesy of Uniformology.